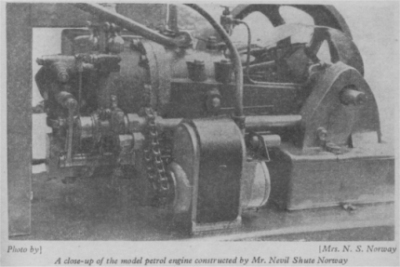 We wish to thank The Model Engineer, Nexus Special Interests Ltd., for permission to reproduce the following article, originally published in the Model Engineer. (27 January, 1949): 93-94 and 97. 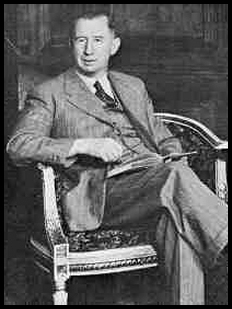 Mr. NEVIL SHUTE NORWAY, B.A., F.R.Ae.S., was one of the founders of Airspeed Ltd., the firm that made about 8,000 Airspeed Oxford bomber trainers during the late war, on which nearly all our bomber pilots were trained, and some of which were used on operational work. It was also respon- sible for the production of the Horsa gliders which were used in such large quantities at D-day. He was educated at Shrewsbury School, R.M.A. Woolwich and Balliol College, Oxford. He served in the 1914 war in the Suffolk Regiment, and in 1922 joined the De Havilland Aircraft Company. Later he was with the Airships Guarantee Co. Ltd. as Chief Calculator, and made the flight to America and back in the R.100. 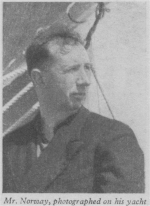 Mr. Norway is known all over the world as Nevil Shute, the author of so many famous books, but it is not generally known that, in addition to his many other activities, he is a very keen model engineer. On receiving an invitation to go to see a model Mr. Norway had completed, I gladly availed myself of the privilege, and the following particulars of the visit will, I hope, be of interest to readers of The Model Engineer. When I arrived, Mr. Norway was adjusting the wireless set on his 40-ft. Hillyard schooner, which was moored alongside the private jetty from the grounds of his house, on the shores of a lovely inlet off one of the harbours of the south coast.